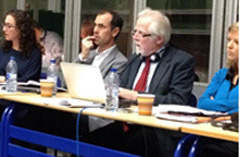 The International Association of Democratic Lawyers (IADL) held its 18th Congress in Brussels from the 15 to 19 April 2014, at which Garden Court's Richard Harvey delivered the Final Declaration as well as a commission on environmental rights. The IADL was founded in 1946 to fight against fascism and, ever since, IADL members from across the globe have stood alongside people's movements and oppressed peoples and have protested against racism, and economic and political injustice. This year's Congress, entitled "Lawyering for People's Rights", was hosted by the Progress Lawyers Network in Belgium. It attracted over 500 progressive lawyers and representatives of social movements from around the world who gathered to exchange experiences, engage in dialogue and to create solidarity. The final declaration, delivered by Richard Harvey, identified the need to rededicate skills and energies to work for the human right to peace, for a world in which all people may live without fear and want in a healthy environment and for a new democratic international economic order in the interests of all, not the privileged few. Delegates agreed to stand for the right to self-determination of peoples in accordance with fundamental principles of international law and to stand against the injustices of oppression, environmental devastation, aggression and foreign occupation. Practical solidarity was offered to lawyers who are detained, assaulted or threatened in countries such as Turkey, Palestine, the Philippines, Columbia and the Basque Country simply for defending the rights of the oppressed against the might of states or corporations. Richard Harvey also co-chaired a Commission on "The human right to a clean and healthy environment" which included interventions from lawyers who have represented environmental activists around the world, as well as experts from Greenpeace, End Ecocide in Europe, Amnesty International and other like-minded organisations. The Congress also focused on the struggle for gender equality, the right to protest and the rights of migrants and workers. Liz Davies, Liz Woodcraft and Sam Parham also attended and contributed to the dialogue, ensuring that Garden Court Chambers was well represented and remains at the forefront of the fight for fundamental rights and liberties at national, European and international level. Richard Harvey chairs Garden Court International and works internationally in the fields of human rights and environmental law.